Life is short and summers unfortunately are that much shorter! But with a few photos and a pair of scissors, you can create a memorable collage of all your best memories from the season. 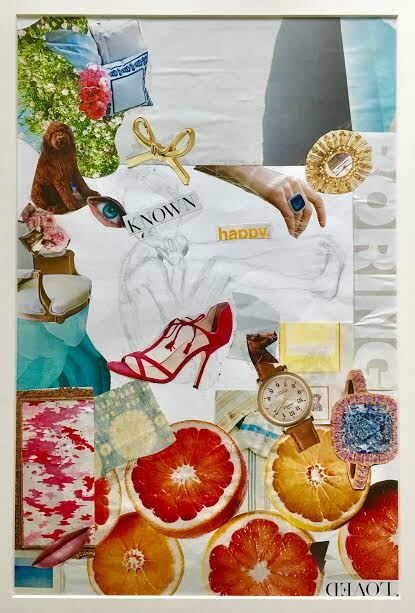 Here is my daughter Haley's collage up close -- I love the pink palette here, very "her." My older daughter Avery is a Pinterest pro & accomplished artist, who will be studying art more next year at college -- just 30 minutes from Portland ME, where we are dying to visit Winslow Homer's studio together! FYI -- It really doesn't matter what the SOURCE of your images is - whether magazine clippings, photos, matchbooks or a sprig of wildflowers....the main thing is to just pull together some visual items that serve as good reference points for what you want to capture. My mom was a big decoupage devotee and we always thought it would be fun to decorate a store-bought breakfast tray with an inset collage of these kinds of images, popped under glass. Would be an amazing hostess thank you gift, wouldn't it! Ahhh, so many ideas, so little time...SOME DAY. If you are feeling intimidated (don't be! :) or just don't have the time, why not lean on some short-cuts to get the same effect?? Here are some great selects from Minted, below. If you go this route, don't forget to throw in a few NON-people photos too -- a close-up of the tablescape at a beautiful cafe you visited, a big pile of orange life preservers stacked in a boathouse, or the flowers that you picked on a hike. Those little visual details are amazing triggers to put you right back to a specific time and place that you want to savor -- I promise!! Hope you all had a great Memorial Day weekend and cheers to a wonderful summer filled with beautiful memories (and collages to capture it all)! !